Tool: Is research working for you? While we hear a lot about getting evidence into practice, it is actually a complex process that involves various disciplinary approaches, beliefs, values and world views. [i] To improve their organizations' capacity for evidence-informed decision making, three Ontario health units had the opportunity to try out a tool - "Is Research Working for You?" - as part of a "Partnerships for Health System Improvement" project, working with Health Evidence™ at McMaster University. 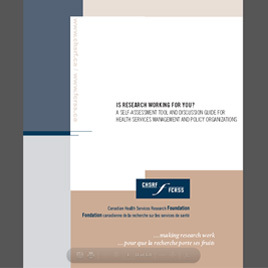 The tool, designed by the former Canadian Health Services Research Foundation (CHSRF) - now the Canadian Foundation for Healthcare Improvement (CFHI) - uses self-assessment to help organizations understand their ability to use research. Four consultants at Toronto Public Health, including Julie Charlebois, a health promotion consultant, were part of the project team. Toronto Public Health worked through the entire tool, devoting 1.5 hours to a structured discussion about all aspects of evidence-informed decision making: acquire, assess, adapt and apply. The tool can help organizations identify weaknesses in their decision-making processes, and uncover the functions and skills of colleagues in other departments. It can be very useful in developing knowledge translation strategies. CFHI is considering revising the tool to eliminate some of the limitations identified by users, including the use of jargon and the time required to complete the tool. The revised version would also allow for different responses from individual as well as organizational perspectives. According to Maria Judd, Senior Director of Innovation and Development at CFHI, "The power of the tool is in structuring a process for discussion and self-reflection for an organization - asking, 'Do we have appropriate human and structural resources in place to support the use of research in decision making?'"